If you're in the market for a smart doorbell, then look no further than the Nest Hello. It's attached to your front door and captures footage of whoever comes knocking. Depending on your settings, you can be informed whenever someone approaches the door and can even talk with them using the Nest app. With the flexible Nest Aware subscription you can also save up to 30 days of video in the cloud and have the camera recognize familiar faces. Always know who's at the door with the Nest Hello and Google Home Hub. This Nest Hello bundle lets you see who's at the door and talk with them - all hands free with the Google Home Hub. Anyone who's looking to increase the capabilities of their smart home need look no further than this Nest Hello bundle. With the Google Home Hub, you can manage your home with the sound of your voice and a handy 7-inch touchscreen. The Nest Hello video doorbell keeps you in the loop about what's happening at your front door - bringing comfort and security to you and your family. Bundled together, it's a deal not to miss. Video footage: The Nest Hello streams 24/7 video footage of what's going on at your door. With HD video, a 160° field of view and night vision, you'll always be able to catch the important details. You can view a live stream at any time on the screen of the Google Home Hub or on your smartphone. Motion and sound alerts: Get an alert to your phone or Hub whenever the Nest Hello detects motion or sound. So even if no one rings the bell, you'll know when someone's at the door. Two-way communication: Communicate with your visitors using the built-in intercom on the Nest Hello. Nest's HD Talk and Listen cancels out echos and noise for crisper sound. Voice control: Control your Nest Hello with Google Assisant on the Google Home Hub. It's as easy as saying, "Hey Google, show me the front door." Smart assistant with visuals: The Google Home Hub adds a whole new dimension to smart assistance. Ask the Google Assistant for directions, and see them displayed on the Hub's 7-inch touchscreen. Music streaming and more on the Google Home Hub: Use the speaker on the Google Home Hub to stream music, podcasts, and internet radio. Streaming services like Spotify, Pandora, and YouTube Music are compatible. Even more with a Nest Aware subscription: Get even more out of your Nest Hello with a Nest Aware subscription. View up to 30 days worth of footage in the app. Or have Nest let you know if it's a stranger or someone you know at the door. Keep tabs on your front door with this Nest Hello bundle. View footage of who's knocking using the 7-inch touchscreen of the Google Home Hub. Thanks to the Google Assistant, you can operate the video doorbell's most important features hands free. The Nest Hello packs astoundingly high quality for its size. The camera records HDR video that you can access live at any time in the app. The 160° field of view lets you see people from head to toe. Even the two-way communication system is optimized to deliver the best possible quality, with its noise cancellation features. Nest and Google's compatibility doesn't stop here. 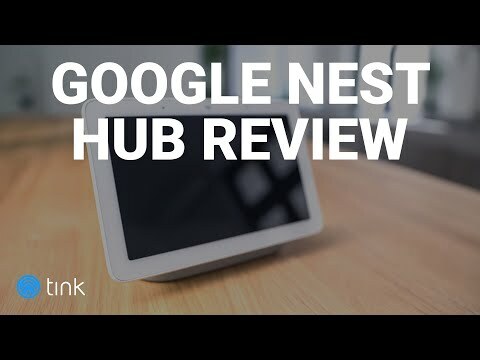 The Google Home Hub also works great with other Nest products, like Nest Cams and the Nest Learning Thermostat. Or delve even deeper and use your Hub with products from other compatible smart home manufacturers. The Google Home Hub could not be easier to install. You'll need some knowledge of wires to install the Nest Hello, but Nest's instructions guide you through the process. Both are high-quality products made from robust matrials. The Google Home app is your one stop app for all things smart home, including the Nest Hello. User-friendly design makes it a pleasure to use. Nest Hello: 24/7 footage, two-way communication, night vision, and more. Google Home Hub: voice assistant, touchscreen, music streaming, and more. The Google Home Hub reliably carries out voice controls. Nest Hello works without hiccups. Both products are well-designed and add a modern touch to your home. The Nest Hello uses 128-bit encryption and two-step verification to keep your data safe. The microphones on the Google Home Hub can be muted at any time. The wide-ranging functionality of these two products makes them well worth the money. Bundled together the price is even better! When does the Google Home Hub record what I'm saying? The smart control center only records your voice when the activation command "Hey Google" is used. Is the Google Home Hub battery-operated? No, it needs to be plugged in at all times. Do I need to subscribe to Nest Aware in order to use the Nest Hello? No, the video doorbell also works without Nest Aware. However, the functionality of the Nest Hello significantly increases with a subscription.